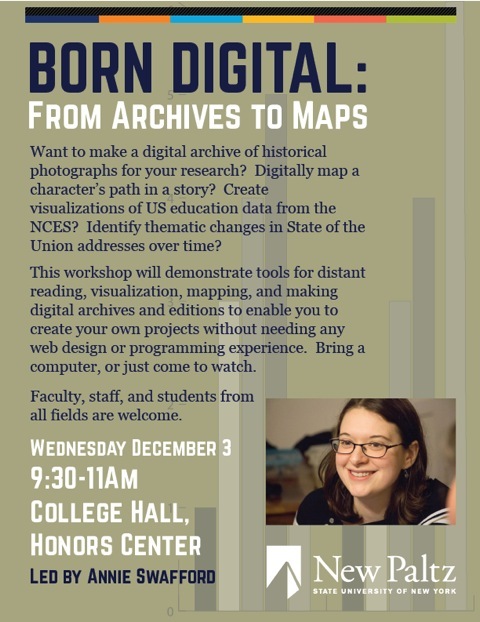 Below are links to the tools, data, instructions, and examples I mentioned in my talk on building digital humanities projects, given at SUNY New Paltz on December 3rd in the Honors College. For those of you new to my work, here’s some information about me. I’m Annie Swafford (although I publish under my full name, Joanna Swafford), and I’m the Assistant Professor for Interdisciplinary and Digital Teaching and Scholarship at the State University of New York, New Paltz. It’s a great college in the Hudson Valley that focuses on undergraduate education and research. I’m teaching two sections of an interdisciplinary 19th century Digital Humanities class (see http://sherlockholmeslondondh.wordpress.com/ or @DHM293 for details) in the Fall, and I’ll be teaching it again alongside an interdisciplinary Victorian literature and culture class in the Spring. For more specific details on my educational background, publications, and other information, check out my Curriculum Vitae. As a graduate student, I built two digital humanities tools to facilitate music and literary scholarship: Songs of the Victorians, an archive and analysis of parlor and art song settings of Victorian poems with an interactive framework that highlights each measure of a score in time with its music, and Augmented Notes, a tool that lets users build their own interdisciplinary websites like Songs of the Victorians. (To find out more about these tools, see https://annieswafford.wordpress.com/digital-humanities-projects/). I’ll be posting updates about the development of these tools, my experiences teaching an undergraduate intro to DH course, and my time as a new faculty member on my blog, so please follow me here and on Twitter (@annieswafford). Also, please comment! I’d love to hear from you.